I have always been a walker, since my youth when I would get dropped off at the golf course on summer mornings by my mother who would pick me up after she finished work in the afternoon. 27 to 36 holes a day was normal for my friends and me. Fast forward to age 49. I am thumbing through one of the golf magazines, when I happen upon an article about a guy who walked and carried his bag for 50 holes in one day the year he turned 50. Sounded like an interesting and fun challenge, so when I turned 50 in 2000, on May 16th , I walked 50 at a local par 72 course carrying a full set of clubs. I had a great time and still have the ball I used (same one for all 50) sitting on my desk. 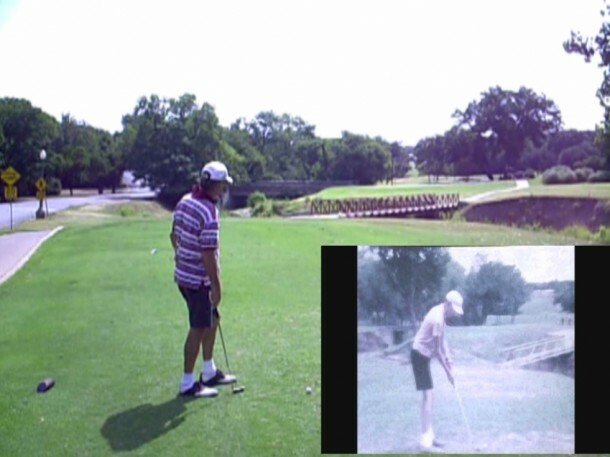 Russ in 2008 and back in 1963 – same golfers, same course, different year. Fast forward to the present and I am up against my next big challenge of 60 at 60. This is going to be a bit tougher. Not only are we there 10 more holes to play, but 10 more years on the body. Here’s my strategy for success, just in case anyone else would be up for the “play your age” challenge. As far as spirit of the rules are concerned, if it’s a regulation course and you walk 40, 50, 60, etc. either carrying or pushing your clubs then it counts for bragging rights. You can use the tees of your choice and feel free to mix them up during the round. To succeed, let the pro shop in on what you a planning as they may be able to help keep you moving throughout the day. It is probably best to play on a “slow” day during the week, maybe a Tuesday or Wednesday. Definitely make sure there are no tournaments scheduled as they will really slow you down. It is a good idea to be the first one to tee off in the morning, while playing solo, so you can get around as fast as possible. Make sure you think positive and get excited for the challenging but enjoyable day. Buy yourself some really good walking shoes that are comfortable with sufficient support. Break them in for at least two rounds. The last thing you want is to get a blister after 27 holes. If you have two good pairs, swap each round. Also invest in at least three pair of good socks, and change after each 18. Your feet will thank you for it! Starting at least a month before the big day, make an effort to walk either 27 or 36 at least once a week. Not only will this get you in shape, it will get you past the mental 18 hole barrier. I find I get tired towards the end of 18, but by the 20th hole I am back in a groove. Try to look at the course and see if there is a convenient 2 or 3 hole loop you could play 2 or 3 times during the day to get in the extra 5 or 6 holes (depending on your age target). It’s much better to finish on 9 or 18 than somewhere in the middle of the course. Remain flexible on the date. You want a day where the high temp is not much over 80 and winds less than 15 mph. You’ll be tired enough just from the walking. You don’t need the extra energy sap from heat and high winds. Remember this is going to take a minimum of 8 ½ hours for 50 and 10 hours for 60, and if there is any slowdowns more like 10 and 12 respectively. And that’s just the play time. Have plenty of power snacks and eat frequently to keep up your strength. After the first round, don’t sit for more than 10-15 minutes or you’ll get stiff. I highly recommend an Aleve before you hit the first tee and another 10 hours later. You may want to mix it up a bit during the day. On my 50/50 I walked two holes barefoot just for a change of pace. This time I may tee off with my putter and putt with my driver or play a couple of holes with just one club. It’ll break the monotony of grinding away hole after hole. Remember that the day is not about score, it’s about walking your age. Swing easy, keep the ball in play, take that extra club and smooth it. Preserve your strength, believe me you’ll need it. Reward yourself. Have your favorite beer/drink ready as soon as you finish or plan to go to eat at your favorite restaurant. A mental carrot to push you through a tough stretch makes it easier. Last but certainly not least, enjoy the experience. How often will you do something crazy like this? Take it all in. You’ll want to remember it for years to come. Great idea, will try to do it on my 55th bday on October 4th. Enjoyed the story and tips, and reminds me of two others of a similar nature. The former head pro at Cuscowilla GC in GA, Chuck Little, I think is his name, used to play as many holes as his age on his birthday every year. But I would be it was in a cart–at least that’s what I surmise. My friend Doll Miller, former golf champ, marathoner and now mountain climber, RAN 50 miles to celebrate her 50th 7-8-9 years ago! Now that’s a feat! I turn 50 in November, and as I can walk and play 36 or 45 without too much trouble, (usually 18 with a caddy, 18 or 27 carrying) perhaps I’ll attempt the “milestone 50” myself this year!